Tidal Volume, a Stakes Winning son of the leading sire, TAPIT, has been retired from racing and will start his stud career at Poplar Creek Horse Center in Bethel, Ohio. Earnings of $231,476 with 8 wins, 3 seconds, 2 thirds from 23 starts. Tidal Volume has won on the dirt, turf and synthetic at 6 different tracks. A very versatile and gorgeous son of the Hot Sire, TAPIT. BIRDRUN, a recently retired Graded Stakes Winner is taking up stud duty at Poplar Creek Horse Center. Earnings $622,816. He is available for inspection! Ohio Stallions Open House is scheduled for Saturday January 18, 2014. A definite time will be advertised at a later date. All stallions standing at Poplar Creek will be on display for your inspection. Everyone attending will be eligible to enter a drawing for a free stud service. Food and drinks will be provided in our heated party room. Please come join us to book your mare or to just join in with good conversation, see old friends or make new ones! >MR MABEE, 2001 dk b/br stallion by the all great Storm Cat. Stakes winner. Producer of current winners. Yearling sells for 25K at the 2013 fall Fasig Tipton sale. Entered stud in 2008. >TWINSPIRED, 2008 grey stallion by Harlan's Holiday out of the El Prado (Ire) mare, Historical Drive. Twinspired is Multiple Graded Stakes Placed, Stakes Winner and earner of over 350K. During the off season, Twinspired will be the Churchill Downs Derby Museum resident horse! 2014 will be his first year at stud. >LOUIE VILLAIN, 2010 dk bay stallion by the great sire, A.P. Indy out of the Graded Stakes Winning mare Pampered Princess by Indian Charlie. Louie Villain has a limited race career due to an unfortunate knee injury. AENEAS: Willy's Pride, winner of a 45K Maiden SW at Parx in his first start! DAVID COPPERFIELD: Delightful Daisy winner of a 42K Allowance race at Arlington! KING OF THE ROXY: Sires his first winner! Prince of the Roxy, first time starter, a clear winner of a MC20K at Lone Star Park on June 16, 2013! THE OHIO SALE BOOKS ARE OUT! The Ohio Thoroughbred Sale Book is out! Please join us on December 3rd, 2017 for the first Ohio Sale in 10 years. Majestic Farm in Batavia, Ohio. 100+ horses consigned, while 80% are Ohio Registered or in foal to Ohio Stallions. As the Ohio Race Program grows, so does the demand for Ohio Registered Thoroughbreds. Poplar Creek will be well represented at the sale with 14 broodmares, 12 of them in foal to Poplar Creek Stallions and carrying Ohio Accredited foals to date. Most of the broodmares being sold retain a 2018 Season to a Poplar Creek Stallion. 11 yearlings, 9 Registered Ohio Accredited by Poplar Creek Stallions, 1 Registered Ohio Foaled. 1 Registered Ohio Accredited weanling by a Poplar Creek Stallion. 1 Registered Ohio Accredited race age horse by a Poplar Creek Stallion. Click here for catalog. Indy Wind, a 5 time stakes winner by A.P. Indy and Zimmer, stakes placed son of Empire Maker, join the roster of stallion at Poplar Creek Horse Center. Please visit their stallion pages on the website. Congratulations to TIDAL VOLUME & VERTIFORMER for siring an absolutely GORGEOUS first foal crop! I would like to thank everyone for attending our 4th annual stallion open house. It was a good day with lots of great people, admiring our well mannered gorgeous stallions. For those of you who missed our open house....call and make an appointment to view the stallions in person. We would like to welcome KISS THE KID to our stallion roster at Poplar Creek Horse Center. Kiss the Kid is a Multiple Graded Stakes Winner with earnings of over $820,000. His sire Lemon Drop Kid stands at Lanes End in Lexington, KY. Please contact us for an appointment to inspect this wonderful stallion in person and others at our farm. Poplar Creek Stallion, KINGSHIP, sires top selling Ohio Accredited at FTKY. The top selling Ohio Accredited Yearling in the October Fasig-Tipton yearling sale in Lexington, KY ... was sired by our stallion KINGSHIP! This yearling was also the 2nd top selling yearling sired by a Midwest Regional Stallion! New Stallions, Tidal Volume & Vertiformer were hits for their first year, we are looking forward to their first foal crop in 2016. Congratulations to Birdrun, Louie Villain & Twinspired for siring an absolutely GORGEOUS first foal crop! Wow! What a great ride the 2015 breeding & foaling season has been! 100% live foal rate on 40 foals born this year! 120 mares bred to our stallions! A big THANK YOU to all our wonderful clients who believe in our operation and our stallions! We look forward to seeing you in 2016! Please join us during our 4th Annual Stallion Open House in January! Congratulations to Birdrun, Louie Villain & Twinspired for producing an absolutely GORGEOUS first foal crop! Please join us on January 3rd for our annual Stallion Open House & Stallion Show. Free stud service drawing, discounts to qualifying mares, heated rooms for your comfort, food & lots of good people and gorgeous stallions! VERTIFORMER - Stakes Winner in France & Mult. Graded Stakes Pl. in America. We are excited to have Vertiformer join our stallion roster in 2015. A stakes winner in France and multiple graded stakes placed in America. Defeating graded stake winners such as Admiral Kitten, Charming Kitten, Stately Victor, Joes Blazing Aaron & Suntracer. This fast son of Dynaformer, the sire of Kentucky Derby (G1) winner BARBARO, is a tall, regal looking individual out of Tempo West, half sister to Belmont Stakes (G1) winner UNION RAGS. He is a half brother to England's Group 1 winner DECLARATION OF WAR, who has recently arrived in America to stand at Ashford Stud near Versailles, Kentucky commanding a $40,000 stud fee. Vertiformer retired from racing in 2014 and will start his stud career in 2015. Entry stud fee is set at $2,000. Proven producers, stake winning mares, multiple mare discounts will be available. Tidal Volume, a Stakes Winning son of the leading sire, TAPIT, has been retired from racing and will start his stud career at Poplar Creek Horse Center in 2015. Earnings of $231,476 with 8 wins, 3 seconds, 2 thirds from 23 starts. Tidal Volume is an extremely versatile horse, winning on all three surfaces of dirt, turf and synthetic at 6 different tracks. A 17 hand tall and gorgeous son of the Hot Sire, TAPIT, who broke the all time leading progeny earning in one season of $16,383,113 (12/4/14), 4 MILLION ahead of the second place horse for the year. Tapit stands at Gainesway Farm in Lexington and holds a stud fee of $300,000 for 2015 and is already booked full. Sons of Tapit have sold offspring for commercial amounts at the high profile sales. Tidal Volume's dam is a Stake producer and half-sister to Group 1 Classic-placed Group 3 SW ILLUSTRIOUS MISS, from the immediate family of Grade 1 SW POLITICAL AMBITION, Grade 1 SW SILVER MAIDEN. Consider this talented son of TAPIT for your mare to carry on this strong sought after bloodline. He is the first son of Tapit to stand in Ohio and the Midwest. Entry stud fee is set at $3,000. Proven producers, stake winning mares, multiple mare discounts will be available. 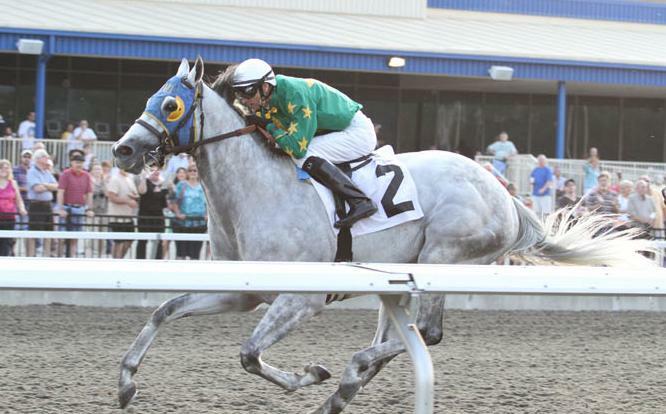 A young unraced son of the outstanding race horse, SPECTACULAR BID, has moved from Florida to stand in Ohio for 2015. Most of us know of Spectacular Bid but few can quote what his accomplishments were as a race horse. In a short version: He won 26 out of 30 career starts, he set EIGHT track records, Champion 2 year old, Champion 3 year old, followed by Horse of the Year. Earnings of $2,701,608. Favorite Bid, an honest 17.1 hands tall and a big mover, correct balance, and pretty are a few words to describe Favorite Bid. Commercial looking foals are one of his qualities. He is also nominated and registered with The American Quarter Horse Association as a breeding stallion for Quarter Horse mares and has been qualified as an accepted stallion for warmbloods. An all around versatile horse. Retired in April 2014 and is taking up stud duty at Poplar Creek Horse Center. A son of Birdstone, sire of Kentucky Derby (G1) winner MINE THAT BIRD and Champion SUMMER BIRD. Birdstone is by Grindstone by Unbridled Song. Birdrun has earnings of $622,816. Winning classice to long distances of 1 mile up to 1 3/4 miles. Placed 2nd in the Breeders Cup Marathon (G2) at Churchill Downs and won the Brooklyn Handicap (G2) at Belmont Park, defeating graded stakes winners such as Drosselmeyer, Alma d'Oro, Eldaafer, Afleet Again. Birdrun's dam is a graded stakes producer and half-sister to G2 winner SOVEREIGN KITTY. 2015 stud fee is set at $2,500. Proven producers, stake winning mares, multiple mare discounts will be available.